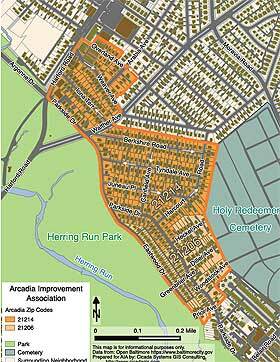 Arcadia resident Thayer Young has created a very useful map of the neighborhood that includes Arcadia boundaries, zip code and street directions for our one-way streets. This is a great resource for Arcadia residents and prospective homebuyers in the area. Another useful online mapping resource is CityView, the City of Baltimore’s mapping portal that provides information regarding city services, and amenities specific to the area.